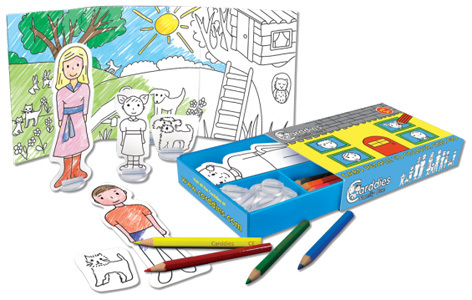 Carddies was created by two sisters (Esther and Raquel) who, inspired by their children’s love of colouring and imaginative play, launched a new range of traditional toys in early 2012. Raquel and Esther designed sets of card people “who live in a box” and can be brought to life and carried in a handbag, backpack or pocket. The products are tailor-made for boys and girls aged between 3-10 years old - and themes include Ballet, Cavemen, Fairies and Football. Each Carddies set contains 12 double-sided, hand-drawn characters made of premium card, with 12 plastic stands, 12 high quality colouring pencils and a hand-drawn card scene as a backdrop and naming card. All are packaged in a sturdy box so they can be taken with you wherever you go. Carddies are 100% British designed, made and assembled using materials of the highest quality. The business has very strong environmental credentials, and FSC certified materials are used throughout the range. The premium uncoated white card with which they are made provides a wonderful colouring surface.